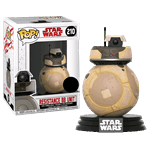 To celebrate the release of Star Wars Episode VIII: The Last Jedi, Funko have released this new desert camo Resistance BB Unit as a Pop! Vinyl figure! The film will follow Rey as she is trained to be a Jedi by her new mentor Luke Skywalker. We’ll leave it there, since nobody likes spoilers. This Pop! features an Orange Resistance BB Unit, who help out wherever they can to take down the evil First Order.